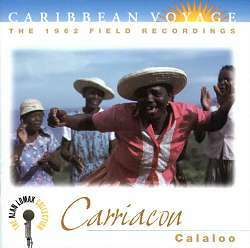 Another CD in the Alan Lomax Caribbean Voyage collection, this time from the island of Carriacou, the largest of the Grenadine Islands, situated between St Vincent to the north and Grenada to the south. For much of its recent history, Carriacou has been an island of migration. In fact, the number of Carriacouans outside of Carriacou is equal or greater to the population of Carriacou itself. This migration may explain in part why Carriacou, a relatively small and isolated island, contains such a wealth of Caribbean musical styles, from the fast, drum-based Big Drum Dance songs to the gentler, more melodic lullabies for solo voice. The best-known Carriacouan musical style is the Big Drum song or Nation song, dating back to the late 1700s, which celebrates the ancestors of the various West-African ethnic groups or nations that were brought to the island (for a more complete discussion of the Big Drum dance and other Carriacou traditional music see Lorna McDaniels book The Big Drum Ritual of Carriacou). The dance of each of the nations - Cromanti, Igbo, Manding, Chamba, Kongo, Arada, Temne, Moko and Banda - has its own distinct rhythmic pattern which helps to identify it. The Cromanti, being the largest ethnic group and leaders of the original society, begin the Big Drum ritual with the Cromanti Cudjo or Beg Pardon song. The other nation songs follow. Musically, Big Drum songs feature short shouted phrases with chorus over two boula drums and a single cut drum. The boula drums and cut drum are typically made from rum barrels, the cut drum being cut shorter and having a higher pitched sound which can be heard over the rhythms of the boulas. On this CD, which the notes tell us is a sampler of future releases of the music of Carriacou, there are six examples of Big Drum songs. Three are Cromanti nation songs, two are Igbo, and one is Temne. One Igbo song and the Temne nation song are particularly arresting. The former, Hausa Wele, features Mary Fortune as the chantwell (or lead singer) with her husband Sugar Adams on cut drum. Both of these musicians have been featured on a number of other traditional Carriacou recordings, including the recordings Donald Hill (who along with Lorna McDaniel wrote the notes for Carriacou Calaloo) made for Folkways Records. The Temne nation song features Jemina Joseph as chantwell, a particularly strong vocalist who regrettably never recorded again. While the Big Drum songs have obvious African influence*, there are a number of selections on the CD which draw strongly from European sources. The European influence in Carriacou's traditional music reflects the island's long history of British and French control. The British influence is evident in the quadrilles, reels, lullabies and chanteys that can be found on the island. The quadrilles and reels found on this CD are performed by a quartet lead by Canute Caliste on fiddle (Canute is also featured on Donald Hill's recordings), with a triangle, bass drum, and tambourine to back him up. The line-up and style of playing is very common throughout the Caribbean, illustrating the pan-Caribbean nature of many of these Creole-European dance styles. The lullabies and chanteys, as is traditional in both the Caribbean and the British Isles, are sung solo or with chorus, but without instrumentation. It is a French survival, the cantigue or cantique (hymn), that is perhaps the greatest find of the CD. The cantique is a French hymn from the baroque period. According to the notes, the cantique is more common in Martinique, where French song books were published, but these are the first examples I've heard of the genre. Le Pwezon Didan La Me (The Fish in the Sea), sung in Creole by an all male chorus led by Charlie Bristol, is a particularly stunning vocal piece. I was astounded at the emotion they were able to communicate with just a few simple repeating phrases. While the style is undoubtedly French, its vocal rendering is undeniably African-American. In addition to the Big Drum songs and the Creole-European dances, this Carriacou sampler includes two anthems or spirituals as well as three pass-play songs. The pass-play songs are similar to those found on Brown Girl in the Ring, an earlier release in the Alan Lomax Caribbean Voyage series and the anthems remind me of spirituals found in Trinidad, the Bahamas, and the southern United States, though they maintain a fairly distinct local flavor. The notes suggest similarities between the anthem I Want to Hear Somebody Pray and the spirituals of the Gullah people of the Georgia Sea Islands, but to my ears sounds it shows a striking resemblance to the Calinda, a stick dance that is found on a number of Caribbean islands, including Carriacou. One Night As I Was Walking was recorded at a nine-night wake and is an example of the strong tradition of funeral music and wake music that can be found throughout African-American communities in the Spanish, English, and French Americas. The surge of the chorus after each stanza makes this a particularly powerful anthem. On first listen a thread of dissonance seems to run beneath the music throughout the CD; perhaps it is the quality of the voices or the style of fiddle-playing. In this it reminded me of my first listen some 10 years ago to the music of the Bulgarian women choirs, somewhat terrifying yet still beautiful. I only mention this because I am convinced that it will take some listeners at least a few listens to accustom their ears to the sound of this music, and to be honest, some listeners may never come around to the majority of this music. Lomax was the not the first to record in Carriacou, nor was he the last. Other recordings include recordings made by Andrew Pearse for Folkways in 1956 and the recordings made by Donald Hill which I mentioned earlier, released in 1980. Still, the Lomax recordings are more complete and of a better quality than the others. The Hill recordings, for instance, seem more intended to introduce you to the music of Carriacou rather than allow you to really experience it; most of the selections are fragments and the music seems muffled and distant. Lomax's recordings, on the other hand, are clear and strong and allow you to feel the performers, and perhaps understand a little the quality of their music. The booklet that accompanies the CD includes a short essay by Lorna McDaniel and Donald Hill on Carriacouan music along with short descriptions of many of the performers, a number of whom McDaniel and Hill recorded or knew personally. There is also a brief description of each track, often with lyrics or lyric fragments. While not the most complete booklet, I think it serves its purpose - though I have often wished they would spend less space on Lomax himself and more on the music and performers. Still, it's a small complaint. Who should buy this CD? Lovers of traditional music, Caribbean or Carriacouan music. Others who are looking for something new, yet old. Those who study traditional music of the Caribbean, or those interested in Caribbean variants of British traditional music. In truth, I don't know who will like this music. I can only say that I do. * Since the work of Melville Herskovits, a common (if often ineffective) way of describing music of the Americas includes placing it along a spectrum, with music of high African content at one end and music of high European content at the other.